Color, CCT or CRI are simplifications that are useful for illumination. However, when physical and biological processes are involved we need to deal with spectra. Color has no physical meaning and only applies to the human visual system. This means that, i.e., for a full understanding of the interactions between light and our brain it is necessary to work with the energy distribution of the photons impinging the dedicated cells in our central nervous system (CNS), this is, the spectrum of light. The specific part of neuroscience that studies this topic is known by scientists as the “non-visual paths of lighting” as opposed to those paths that enable vision, which are related to color. The same applies for biological processes, i.e., plant growth or light for horticulture, since photosynthesis efficiency strongly depends on the chlorophyll absorption spectrum. In our products, we are committed to the highest standards with regards to spectral accuracy and precision. This implies the use of multichannel LED engines that span the visible range without gaps in the SPD (spectral power distribution). 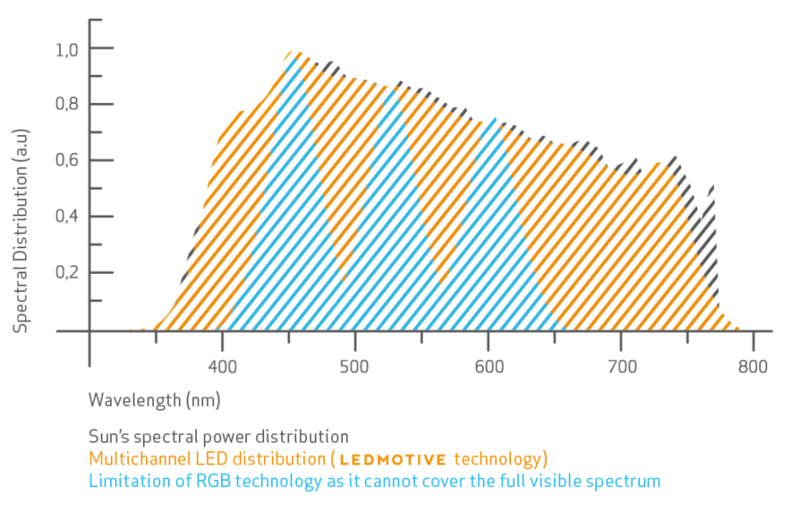 Flatness is achieved thanks to a careful combination of single-peak LEDs and phosphor-converted LEDs. Wavelength shifts are compensated for via feedback from an onboard spectroradiometer. Thanks to our multi-channel light engines, any light spectrum can be mimicked (i.e. Sunlight), while other RGB-based technologies only cover a limited part of the visible spectrum.